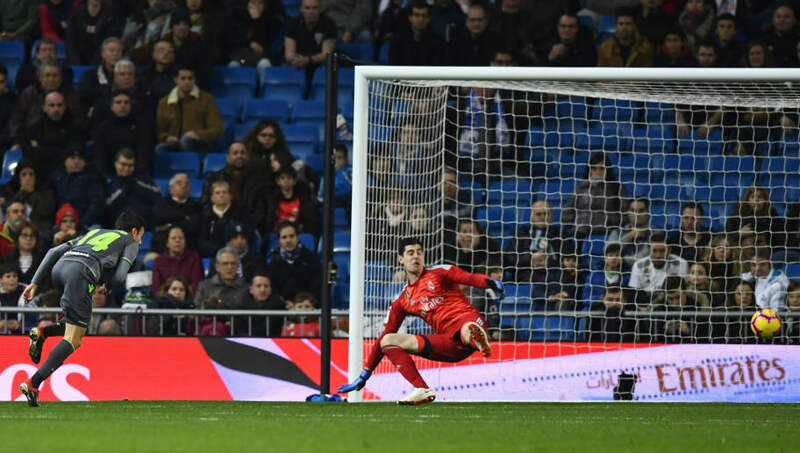 Real Madrid fell to a shock 0-2 defeat at home to Real Sociedad on Sunday as Santiago Solari's side continue to struggle through a tough start to the New Year. Both sides had plenty of chances early in the second half, though neither side could capitalise. Geronimo Rulli made a succession of saves from a flurry of close-range ​Real Madrid shots, including one from Vinicius Junior, just two minutes into the half. Adnan Januzaj also spurned a presentable opening for the visitors in the 53rd minute. The home side had a seemingly clear penalty appeal waved away midway through the second half, whilst former ​Manchester United star Januzaj failed to convert two further big chances for Sociedad. With the days of ​Cristiano Ronaldo's goal -coring heroics long gone from the Bernabeu and ​Gareth Bale absent from the side, Real Madrid simply lack any cutting edge in their front line to capitalise on their dominance in possession. With ​Luka Modric and ​Toni Kroos remaining as the maestros in the engine room, Los Blancos maintain their usual ability to control a game from the middle of the park and play forward at will. Madrid had 66.9% possession and 10 shots to Sociedad's one in the first half, but still went in 0-1 down at the interval. Without a top-quality forward to get on the end of their attacking moves, Solari's side are completely devoid of the required killer instinct to put the opposition to the sword as top sides should. STAR MAN - Making his first league start for Los Blancos, Vinicius Junior proved that he is capable of becoming the missing star in Real Madrid's attack. The Brazilian was lively throughout, cutting inside from the home side's left wing at will and causing Sociedad problems every time he received the ball. Still only 18, Vinicius lacks the end product in his game at present, but his direct attacking style could make him a natural successor to Ronaldo. WORST PLAYER - Lucas Vazquez epitomised Madrid's lack of quality in attack, offering very little quality from Madrid's right flank, whilst the winger was equally careless in being sent off for two yellow card offences either side of half time. The Spaniard's dismissal left Madrid with too much work to do at 0-1 down. Los Blancos then return to La Liga action next Sunday as Solari's side travel to face Real Betis at the Estadio Benito Villamarin.